You may or may not be a fan of alternate histories, but don’t you wonder how ancient Greek mythology would have developed if people still believed it today? I think the modern pantheon would look very different. There was a prophecy that one day the son of Zeus and Metis, one of Zeus’s many mistresses, would overthrow his father. A complicated and somewhat disturbing story follows (Metis turns into a fly, and Zeus eats her), but in the end they have a daughter. Zeus isn’t concerned because, of course, no woman could overthrow the king of the gods! That daughter was Athena, goddess of wisdom, logic, justice, democracy… she has a long résumé. It seems to me that here in the 21st Century we’ve come to depend a great deal on the things Athena represented. Zeus, god of lightning, couldn’t be so important. Lightning isn’t a mystery. It’s caused by a static charge forming between dust or water particles in the air. Furthermore, scientists in the Abu Dhabi Desert recently created rain for 52 days. By generating ionized particles, they forced what little moisture was in the air to condense and fall as raindrops. If we continue developing technology to control the weather, it’ll be the death of any weather deity. Greek mythology was about personifying the various forces at work in people’s lives. If those stories had continued into the modern world, a world where science has overcome many old superstitions (let’s not mention creation theory right now), then Athena has become queen of the gods. 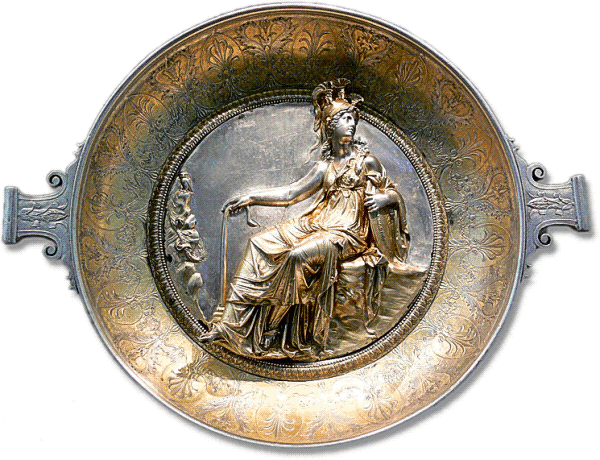 The picture above is of a Roman plate depicting Minerva, a.k.a. Athena, from circa 1st Century BC. Courtesy of wpclipart.com. For more information on artificial rain in the Abu Dhabi Desert, click here. I’m curious to hear what you think. If the Greek gods were still around, who would be in the modern pantheon? What new gods would we have created? Posted by J.S. Pailly on March 2, 2011 in Uncategorized.